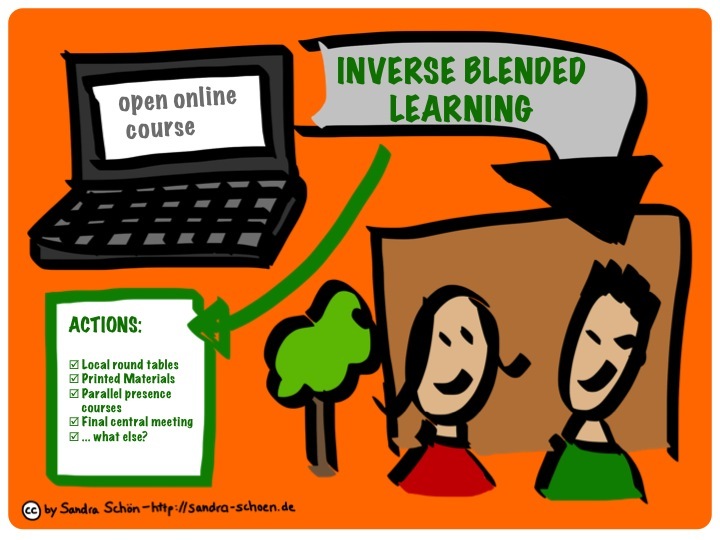 Inverse Blended Learning – Why we need and how we try it! Sandra and I prepare a MOOC about Free Learning with the Web in German language at the imoox.at platform. It will be of course an OER course (CC BY), but what is even more challenging: The target group are people with some or even less Internet know-how without any e-learning background. Thinking about the consequences on how we may adress them (not only before, but even while the course) and not being limited on the pure online aspect, we are developing a „inverse blended learning“ scenario. We will bring the open online course more into the „concrete“, „practical“ and „real“ surrounding and context of the learners. (And we are sure that this is not only interesting for our „very special target group“). Delivering a .pdf for own print, but also printed versions (for free) in local organisations (in German speaking countries). Following the idea that people need some additional learning material we will also provide a small textbook for the course. Asking supporter for local meetings of learners, eventually parallel presence courses to the online course. Due to the fact that learning is a highly social process we would like to give learners the chance to be part of an online as well as offline community. Inviting to a central final closing event. … and we are happy to get your feedback on this!